Abdullah Sulaiman is a general engineering junior and Mustang News columnist. The views expressed in this column do not represent the viewpoints or editorial coverage of Mustang News. Have you ever thought about where the news we read comes from? Or how the sources of our news affect the domestic and foreign priorities we have as a nation? According to Business Insider and Forbes, there are six corporations that control 90 percent of the media in America and 15 billionaires who own America’s news media companies. These five corporations are Viacom, 21st Century Fox, Comcast, The Walt Disney Company, CBS Corporation and News Corp. 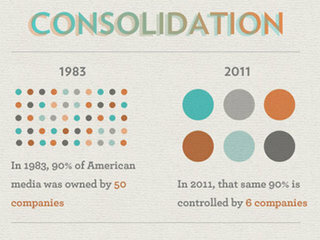 This is a drastic decrease from the more than 50 companies that existed individually in 1983 before corporate media consolidation. These media conglomerates own hundreds of individual news stations nationally and produce the majority of the United States’ mainstream media we consume, from news to entertainment. This is deeply problematic because it limits our exposure to the interests and ideas of others and many perspectives go unheard. Important national and global news is controlled by these conglomerates that choose what gets covered and how long they spend time on issues. This fuels the polarity that exists in politics today. When our news providers become loyal to a political ideology or individuals who endorse them, they become less focused on the truth and soundness of their coverage. Comcast spent $30 million on lobbying in 2015 and 2016, ranking 14th in top lobbying spenders of 2016, paving the way for further mergers and acquisitions, like Time Warner Inc.
An ironic example of the results of media conglomeration is a recent event concerning the Sinclair Broadcast Group, who owns more than 190 TV stations across the country and whose news reaches 70 percent of American households. The company had all the news anchors on their stations read the same scripted news piece on the dangers of one-sided, biased news. If the content of 190 stations is controlled by one or a few figures, is that not itself one-sided and biased? These figures influence our perception of the world and the matters of societal concerns therein. This causes individuals to become unintentionally ignorant of issues that plague our government, our country and the world at large. How else will we become aware and care aboutthe incredible amount of homelessness in this country, the lack of proper schooling in some areas, the prison industrial complex, the military industrial complex, the daily massacres and bombardment of Syrian civilians by their government, the 20 million-plus living in famine in Yemen and East Africa or the 500,000-plus Rohingya Muslims from Myanmar forcefully kicked out. The list goes on. An example portraying this unintentional unawareness is the crisis in Syria. More than 5.6 million people are refugees, 6.6 million are internally displaced and tens of thousands of innocent civilians have been killed. However, a poll conducted by Harris Poll showed that only 17 percent of Americans correctly ranked the Syrian conflict as the disaster that has “impacted the most people” when compared to the Indian Ocean tsunami, Hurricane Katrina, the Rwanda genocide and the earthquake in Haiti. The crisis has impacted 12.2 million people more than Hurricane Katrina, the earthquake in Haiti and the Indian Ocean tsunami combined. Part of this unawareness is due to the mainstream media prioritizing ratings instead of fully exploring the true nature of the conflict, as criticized by Huffington Post. The war in Syria cannot be reduced to a simplistic good guys versus bad guys narrative and therefore becomes less interesting to audiences who want easily digestible media. As always, we possess the power to protest and change these unjust situations. It is on us to elect politicians who won’t sell out to lobbyists and who will take charge in upholding regulations on these conglomerates, such as Sens. Kirsten Gillibrand (D-NY) and Cory Booker (D-NJ), who recently swore off contributions from corporate political action committees. Making change starts with seeking more information. All of this is truly dangerous to our democracy. When there is no longer a diversity of perspectives or content, the world around us that lies in the shadow of corporate media will continue to decay, unless we take the control back.